12.5" RCOS @ ~f/9 (2880 mm fl) 0.64 arcsec / pixel. The Zoomify image scale is 0.80 to 3.20 arcsec / pixel. Click here for the color mapped narrowband image. eXcalibrator for (b-v), (v-r) color calibration, using 12 stars from the NOMAD1 database. PhotoShop for LRGB plus Ha combine & on-linear stretching. The Ha data was added to the LRGB's red channel and OIII to the green and blue using the lighten option for opacity. 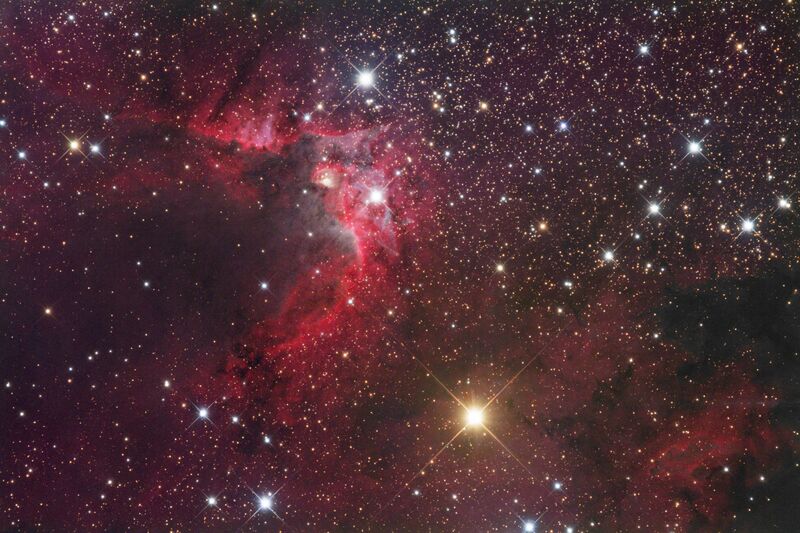 Sh2-155, The Cave Nebula, is a faint area of Ha emission and dust in the constellation of Cepheus. The nebula gets is name from the darker area, at the center left, which visually appears as a cave. This highly stretched image brightens the cave and shows some of its structure.